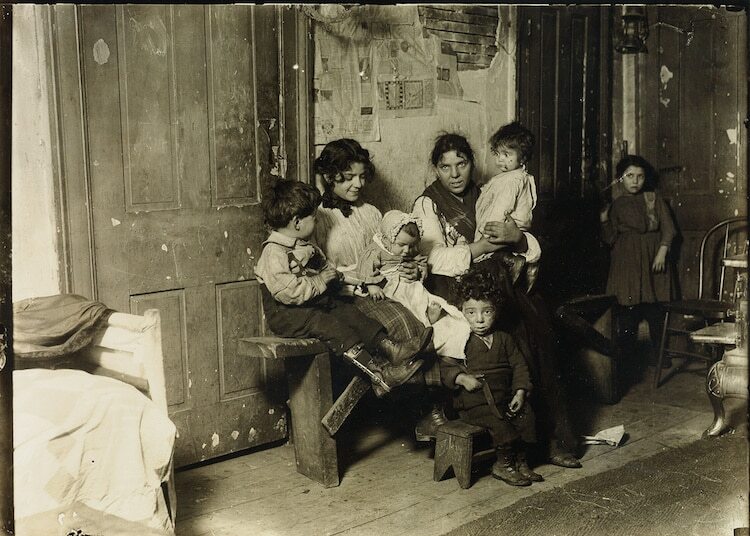 Following in the footsteps of Jacob Riis, American photographer and sociologist Lewis Hine used his camera to spark social change. In fact, his work helped ensure American child labor laws were enacted in the early 20th century. 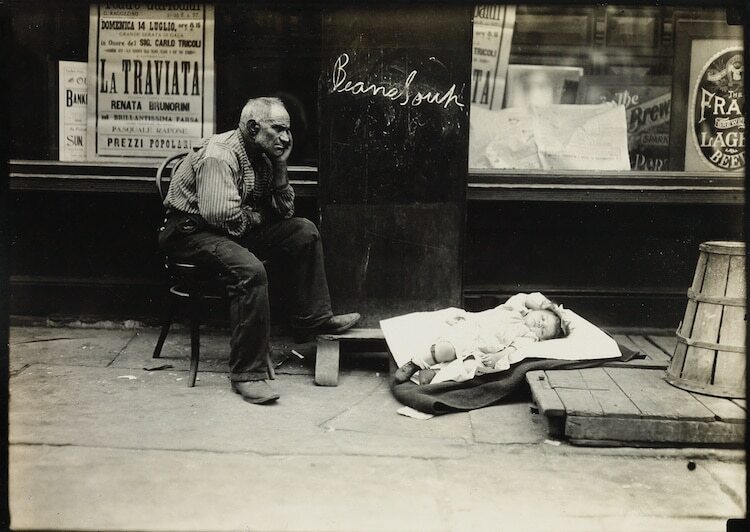 Inspired by early fine art photographers like Alfred Stieglitz, his images are a mix of artistry and photojournalism. 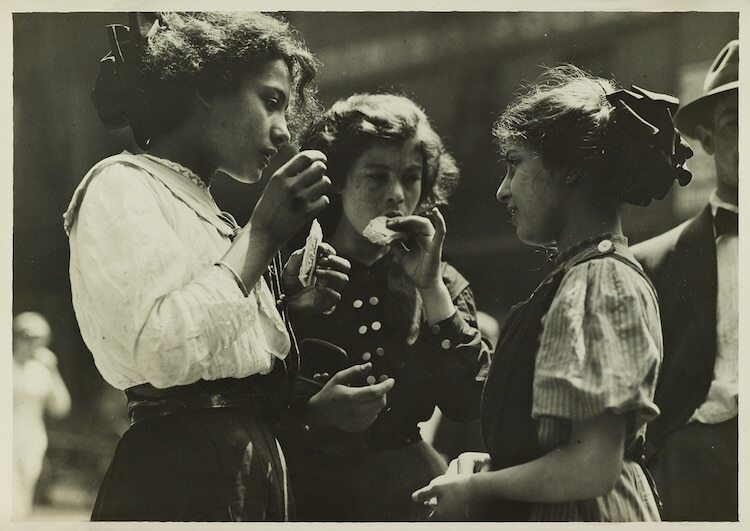 Hine’s professional foray into photography began in 1901, when he was hired not only to teach nature and geography at the Ethical Culture School in New York, but also photography. 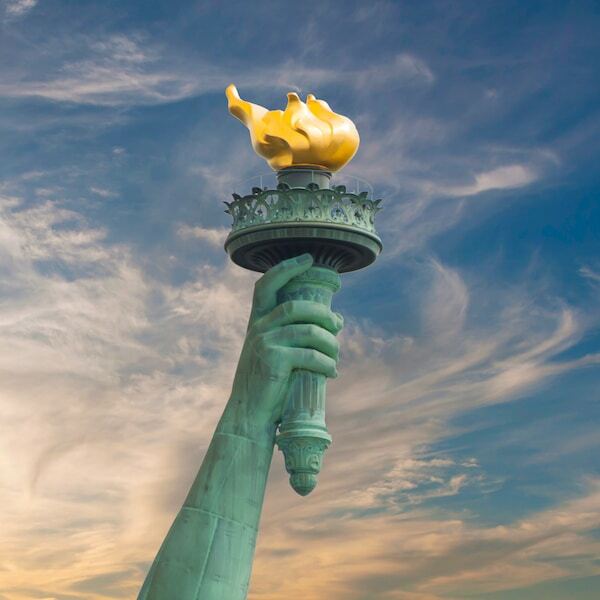 It was here that Hine learned just what a powerful tool the camera could be, leading students on projects to photograph immigrants at Ellis Island. 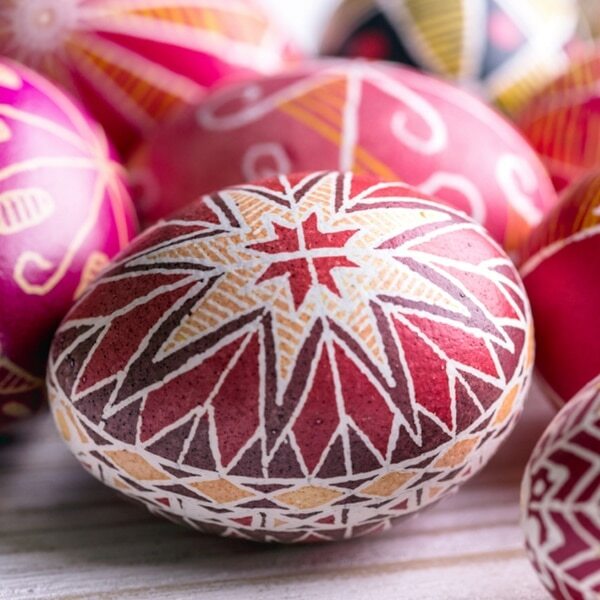 It was his hope that these children, many of whom had Eastern European origins, would better understand the plight of immigrants by seeing what they went through to enter America firsthand. 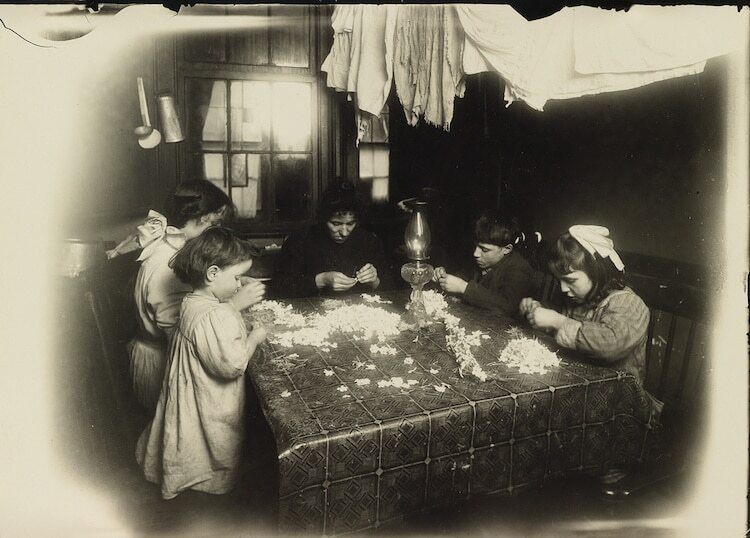 Eventually, in 1908, Hine became the photographer for the National Child Labor Committee (NCLC). The organization was trying to regulate and outlaw child labor, an arduous task given how profitable it was for businesses. Hine, often in disguise, entered factories around the country to document the harrowing conditions that children were working under. 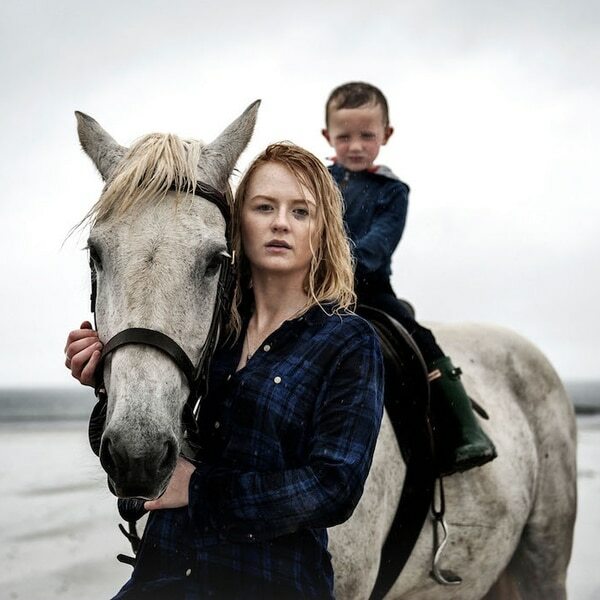 Having started working in factories at age 18 to support his family after his father died in an accident, Hine could certainly relate to the dire situations these children were placed in. 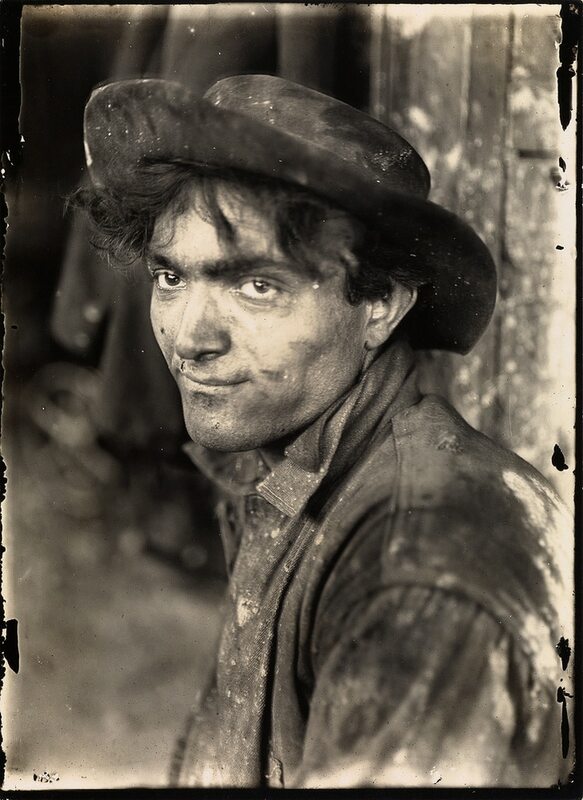 ‘Italian steel worker,’ Pittsburgh. 1909 (printed circa 1931). 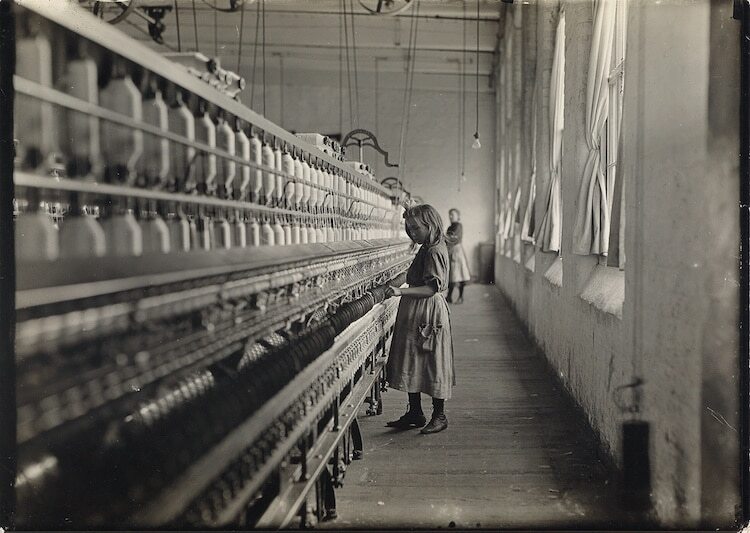 Whether showing a young girl working in a cotton mill or groups of boys breaking coal, his photographs exposed the dark underbelly that was pushing forward the American Industrial Revolution and were instrumental in enacting change. 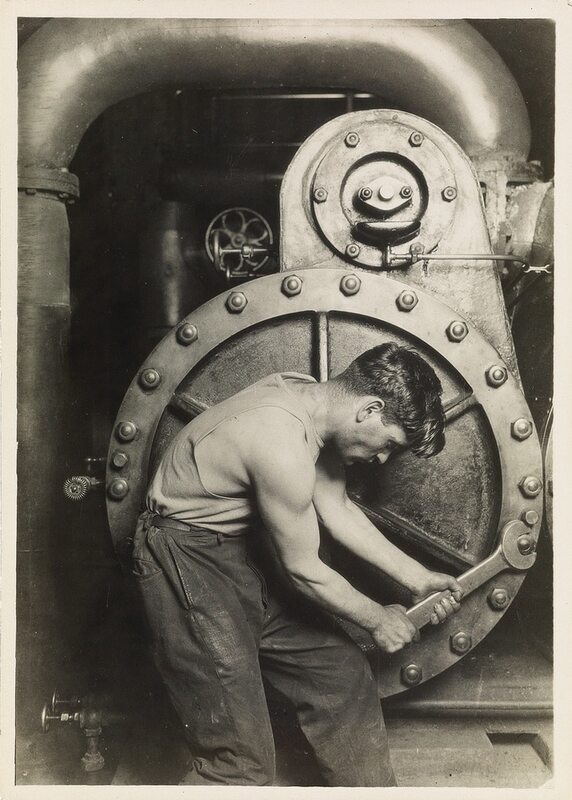 Throughout the 1920s and 1930s, Hine continued to photograph workers, giving us a window into the backbreaking labor needed to build up the American economy. 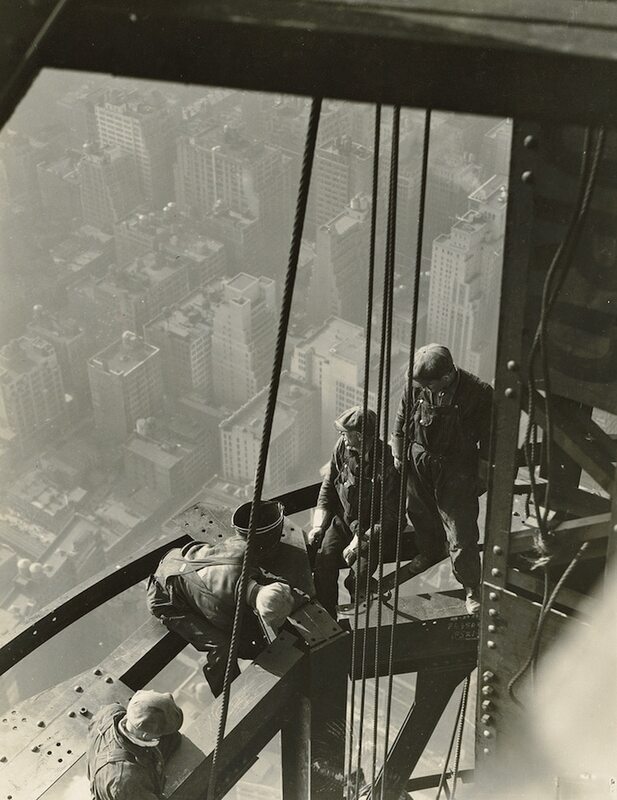 He also documented the building of the Empire State Building, showing the strength and tenacity of the laborers who constructed this epic monument, culminating in the classic photography book Men at Work. After working for the American Red Cross, Works Progress Administration, and the Tennessee Valley Authority, Hine fell upon hard times later in life. 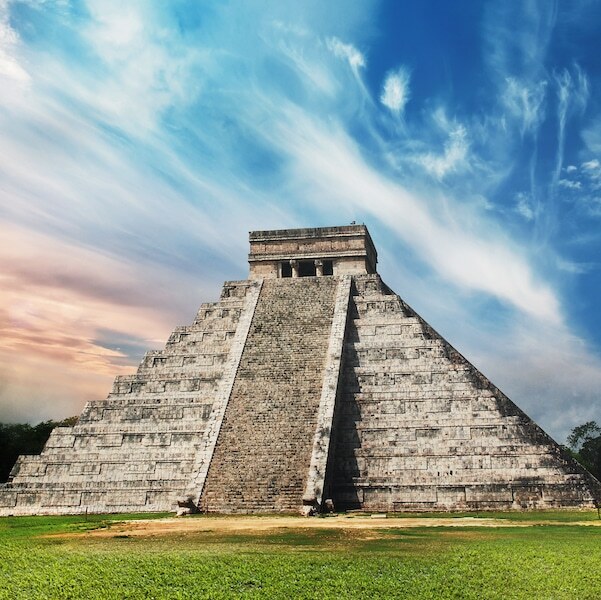 Interest in his work dwindled, and he was forced to apply for welfare before passing away at 66 years old in 1940. Over time, the public has come to appreciate the important role Hine’s work had in shaping social justice in the first half of the 20th century. And interest in his artistry, with the soft blurred focus and compositional choice of his photographs, helped his legacy gain momentum. 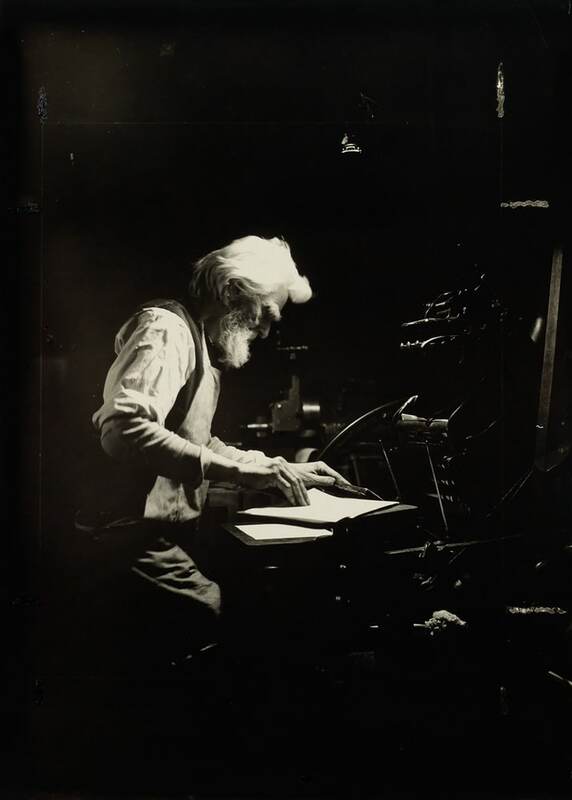 Hine’s son later donated his prints and negatives to the Eastman Museum, after they were turned down by MoMA. 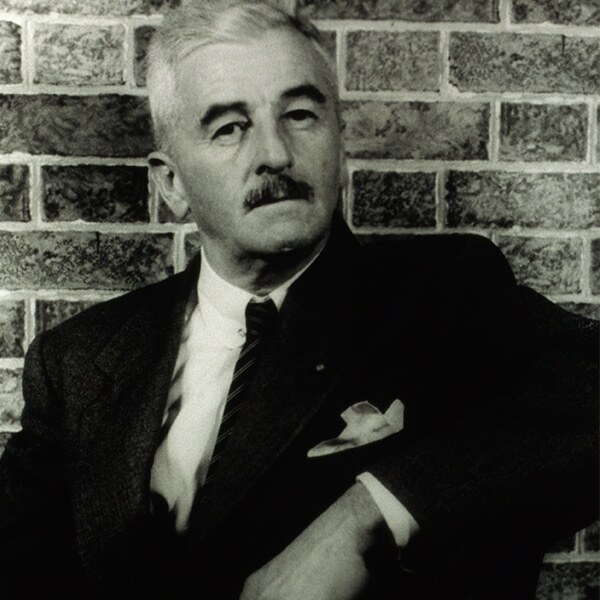 Now, his work is as popular as ever, with 24 rare prints recently selling at auction through Swann Auction Galleries. 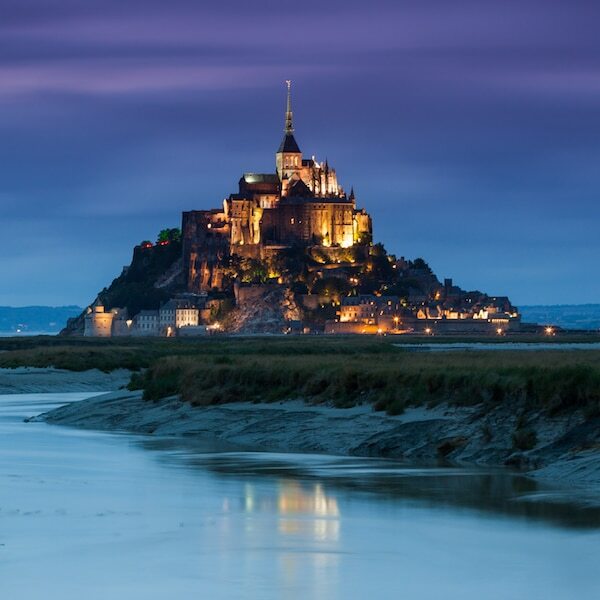 Hine once said, “[Photographers are] the Human Document to keep the present and the future in touch with the past.” And indeed, by this definition, he certainly fulfilled his duty. 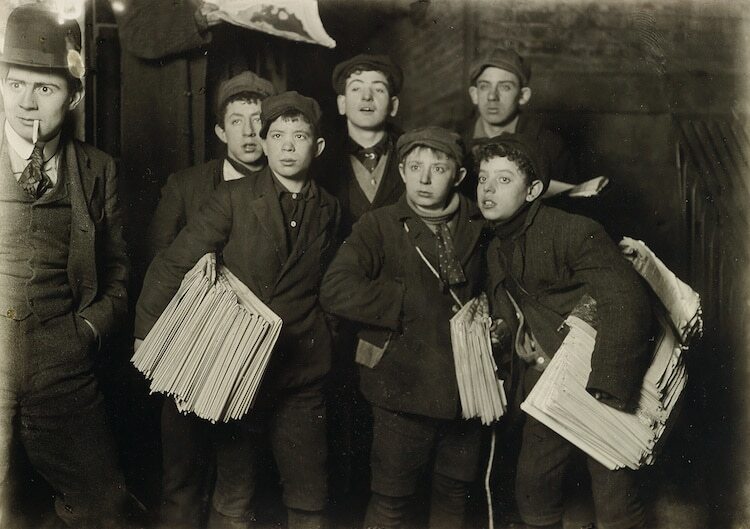 Lewis Hine was an early 20th-century photographer and sociologist who used his camera to enact social change. ‘Tenement family,’ Chicago. 1910 (printed circa 1931). 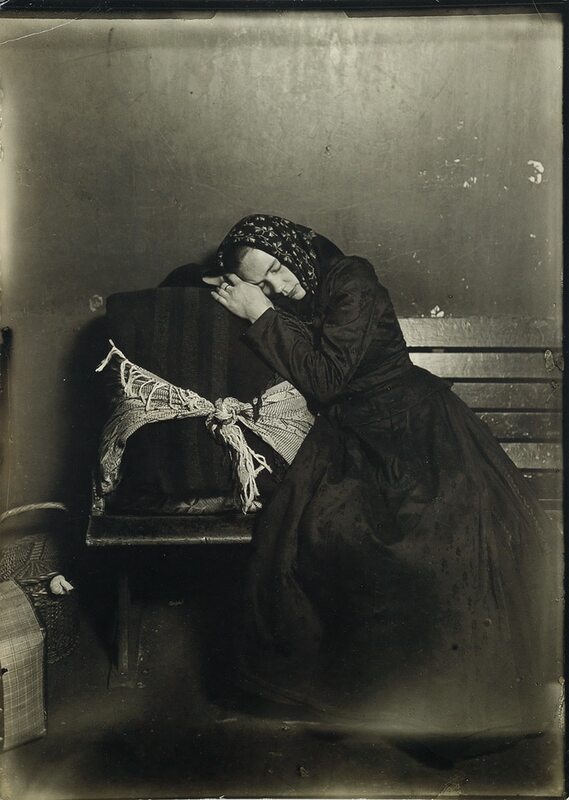 ‘Slavic immigrant at Ellis Island.’ 1907 (printed circa 1931). 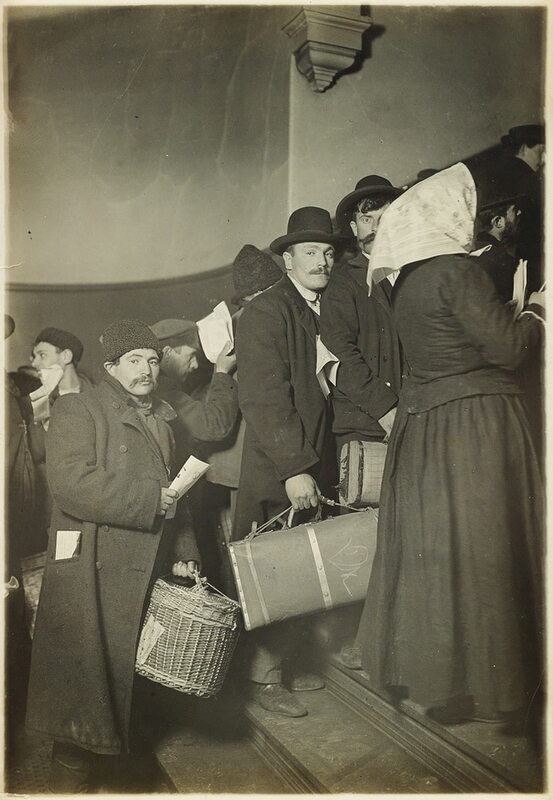 In 1904, Hine began photographing immigrants at Ellis Island, hoping that the images would change perceptions of how they were received by society. 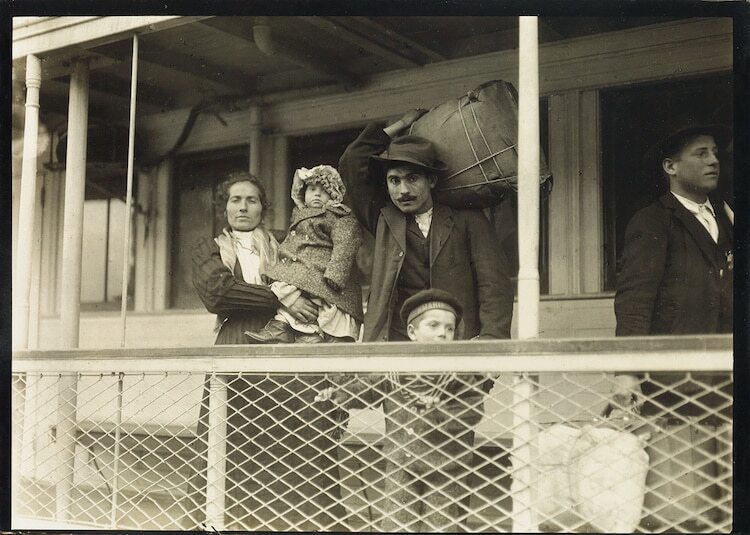 ‘Italian family on the ferry boat landing at Ellis Island.” 1905 (printed circa 1931). 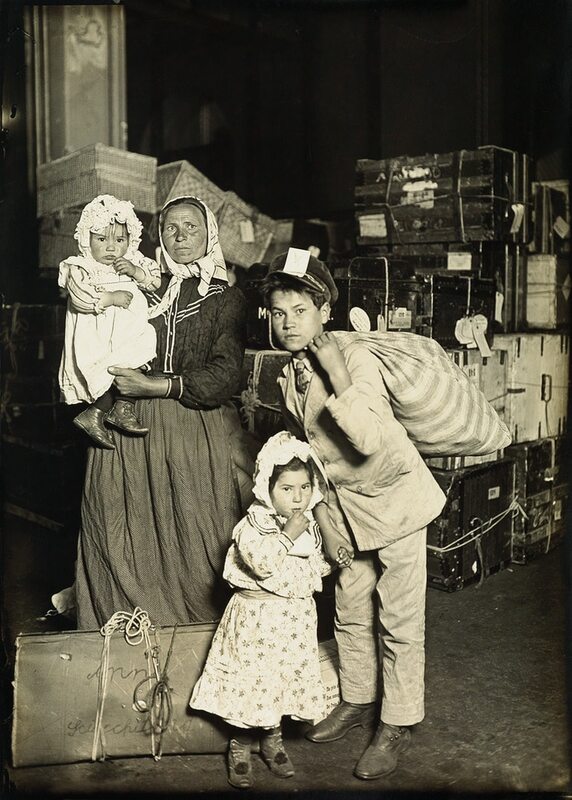 ‘Italian Family in the baggage room at Ellis Island.’ 1905 (printed circa 1931). ‘Climbing into America (Ellis Island Group).’ 1908. 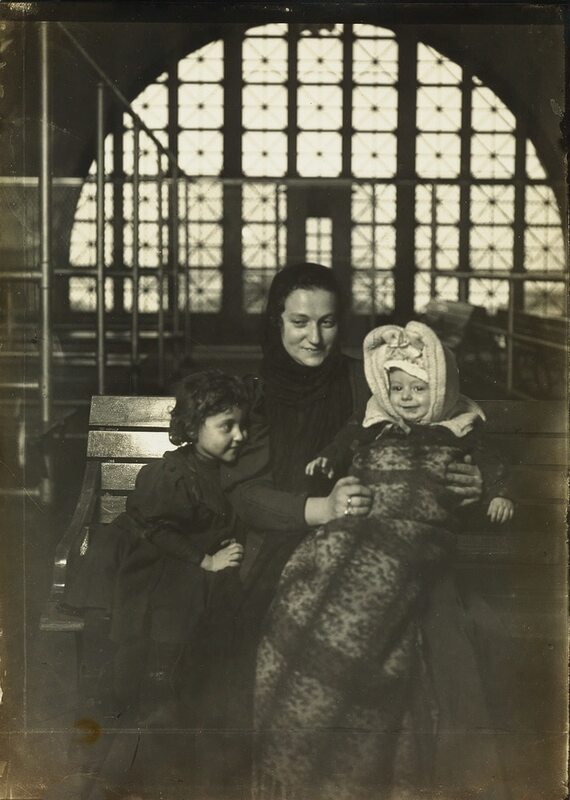 ‘Russian Family at Ellis Island.’ 1905 (printed circa 1931). 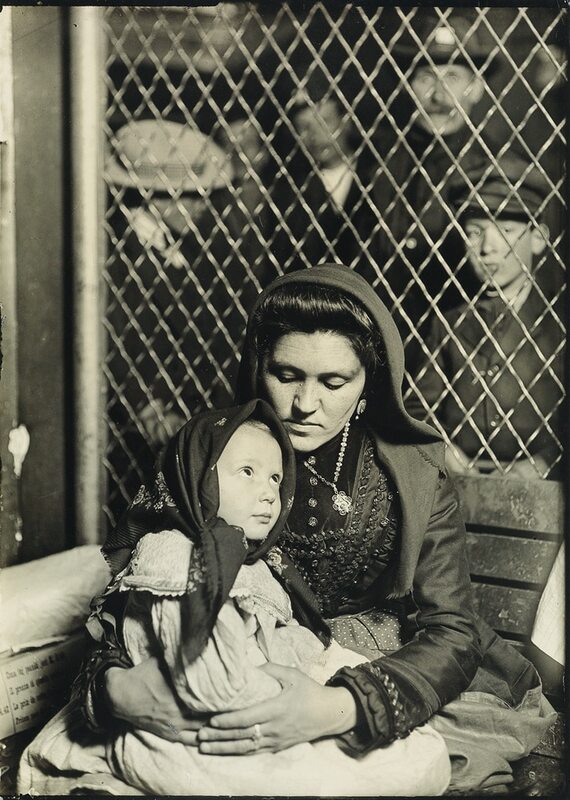 ‘Mother and Child, Ellis Island (Italian Madonna).’ circa 1907 (printed 1931). 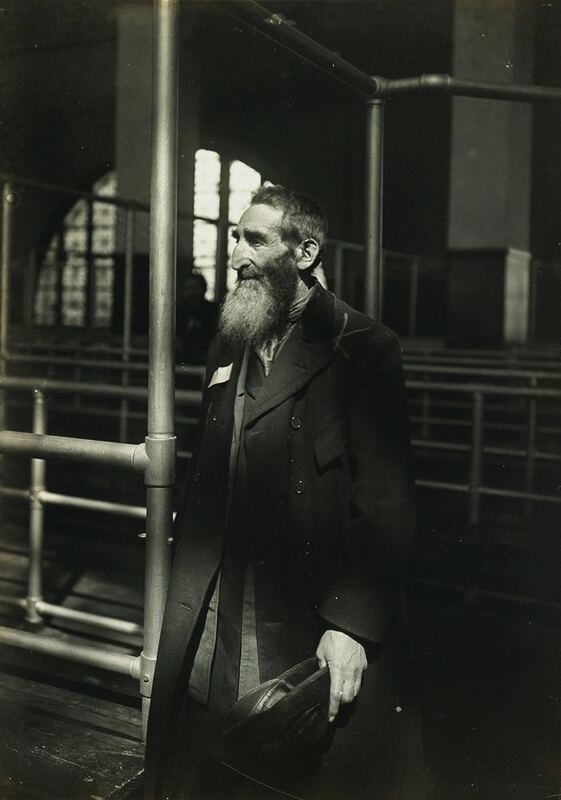 ‘Patriarch at Ellis Island.’ 1905 (printed circa 1931). Hine’s photographs of child labor were key in helping the National Child Labor Committee pass strict laws to protect children against abuse. ‘Noon hour in East Side factory district,’ New York. 1912 (printed circa 1931). 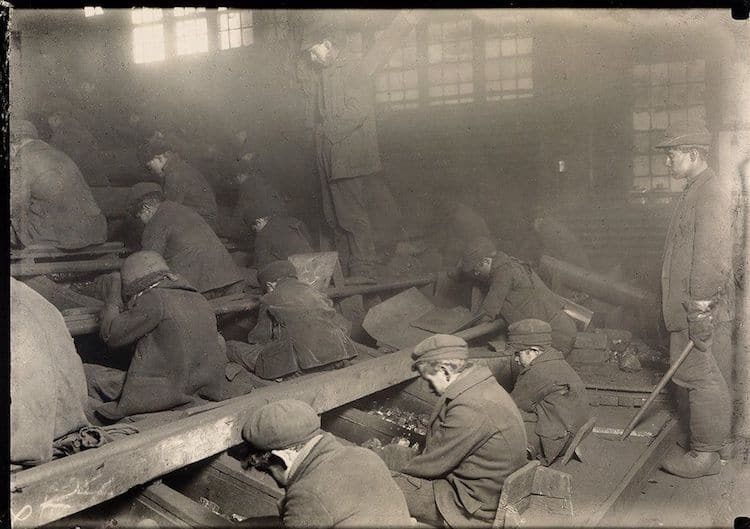 ‘Pennsylvania coal breakers (Breaker Boys).’ 1912 (printed circa 1931). He even documented the construction of the Empire State Building, later publishing the work in the well-regarded photo book, Men at Work. 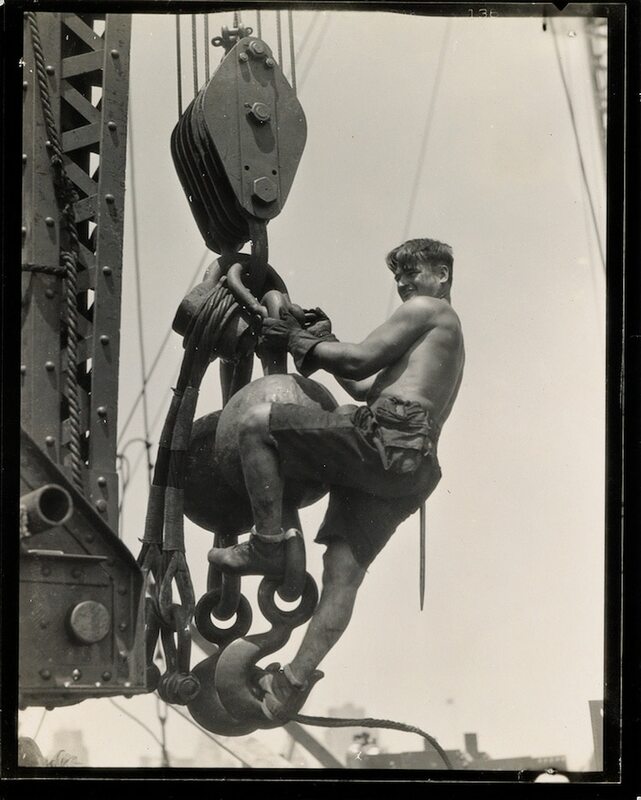 ‘Laborer on connector, Empire State Building.’ 1930-31. 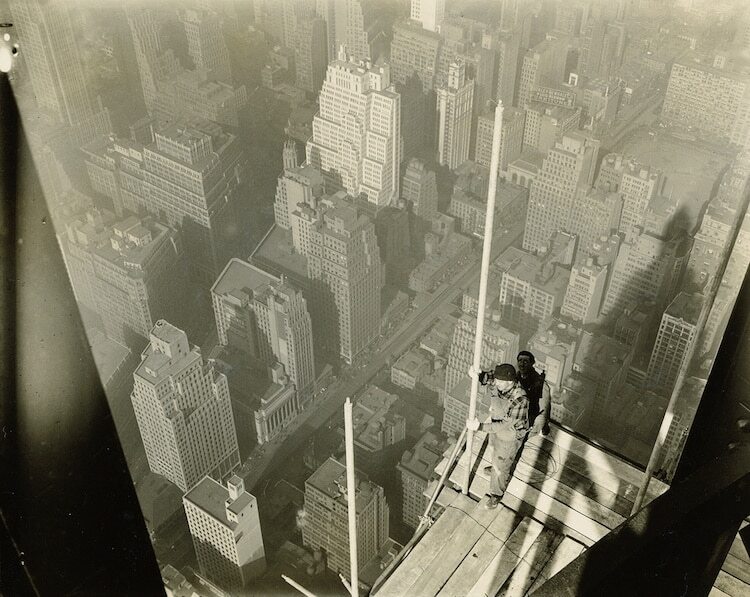 ‘Workers on girders, Empire State Building.’ 1930-31. 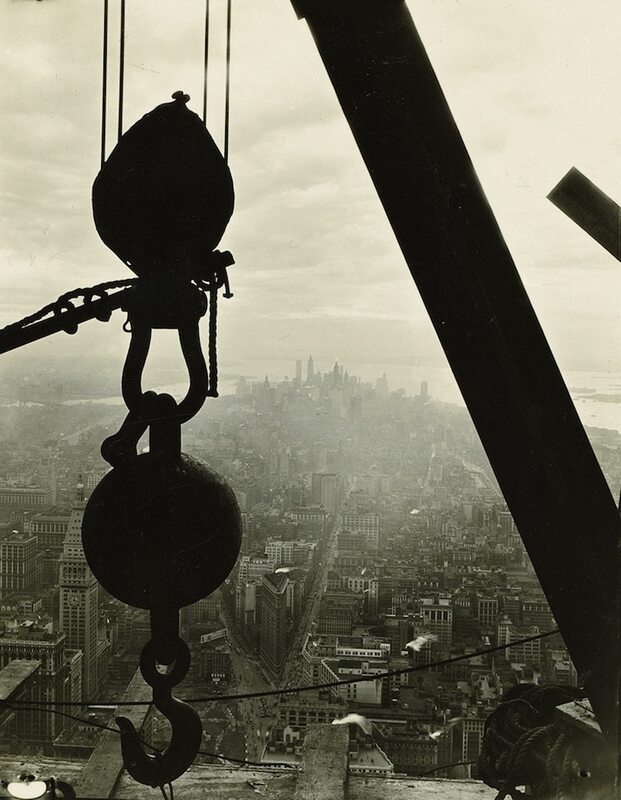 ‘Silhouetted crane hook (with lower Manhattan visible from Empire State Building).’ 1930-31. ‘Worker on platform (with shadow of Chrysler Building).’ 1930-31. 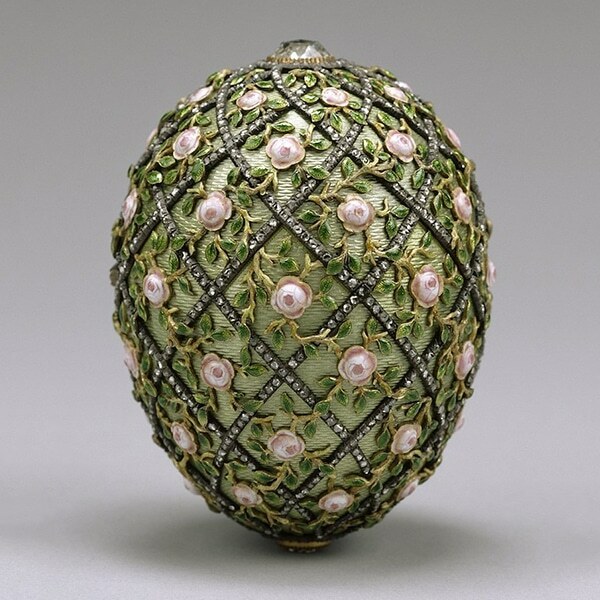 A rare set of 24 prints were recently sold at auction at Swann Auction Galleries. 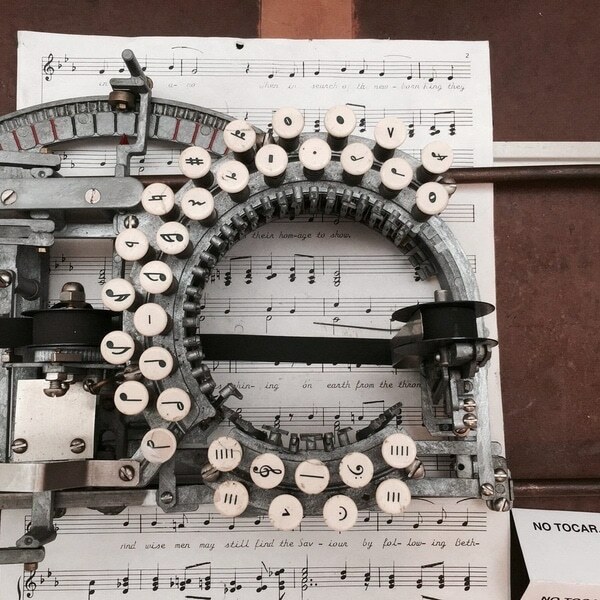 ‘Printer, Ethical Cultural School,’ New York. 1905 (printed circa 1931). ‘Hot Day on East Side,’ New York. circa 1908 (printed circa 1931). ‘Nashville (Sol. 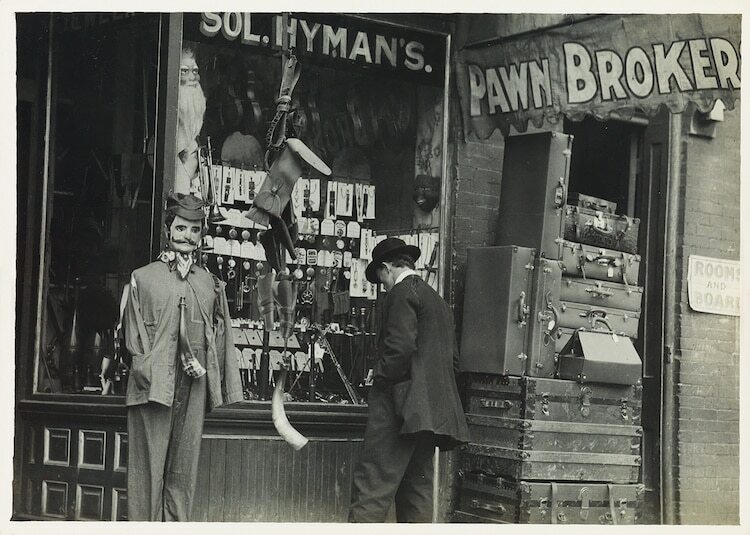 Hyman’s Pawnbroker).’ 1912 (printed circa 1931). 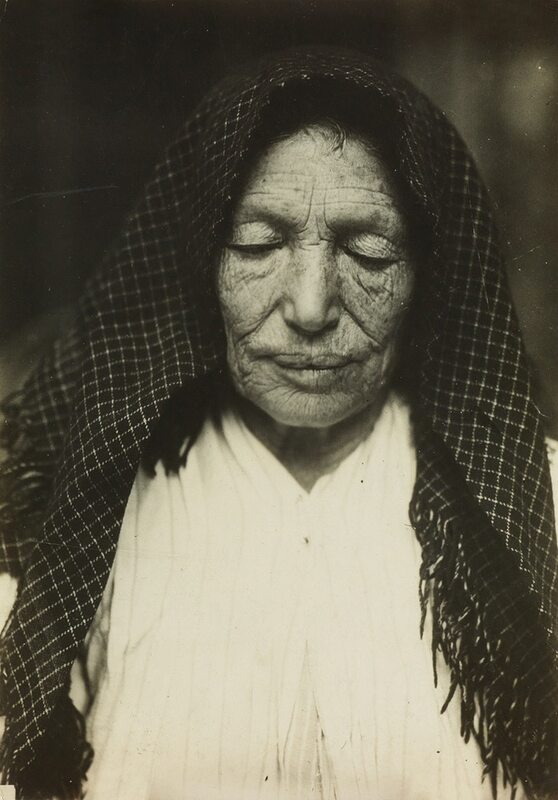 ‘Hull house beneficiary, Italian Grandmother.’ 1910. 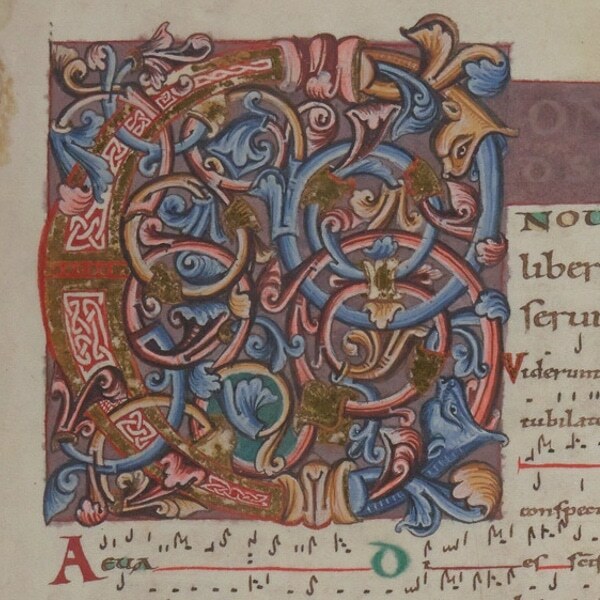 My Modern Met granted permission to use photos by Swann Auction Galleries.